View the External Channels Manual here. If you have any questions or remarks, do not hesitate to contact us. Sailmon provides an interface to send data to it, and display it on the various displays. This function is called external channels. Sailmon supports to receive up to 256 external channels. The external channels are available inside Sailmon, and the description text can be changed from the user to fit the interface. – Any particular data value send 10Hz max. Exceeding the above might result in slower system response and excess heating of the server instrument. UDP packets are parsed on a packet basis, packet data must not be started in one packet and continued in the next packet. 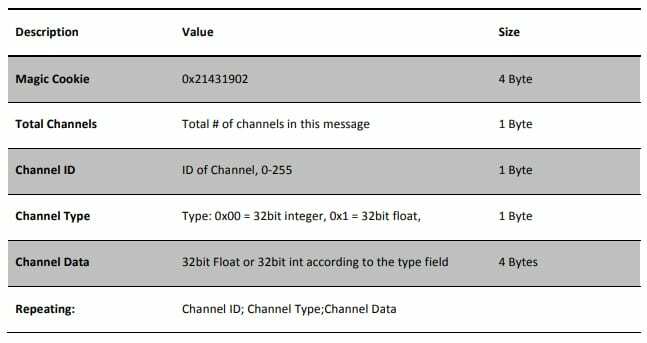 External Channel Data show up in Sailmon as “External Channels”. The user can assign a unit the each channel, so the display shows the correct unit afterwards. • followed by next channel Id, type and data etc.